Important New Tool Available: The Abbott Color Wheel! Many of you may already be familiar with Russ Abbott's colorful tattoo work, or with the books and tutorials that he's published in the past. I'm a big fan of Russ's work and have enjoyed seeing it evolve through the years; he and I even had a collaborative seminar together last fall, which we offer as a streamable tutorial. But his latest creation is unique: The Abbott Color Wheel features scientifically sampled swatches of the complete line of color tattoo pigments from Eternal Ink, arranging them on a wheel with several "gamut masks" which can help you to choose the best compliments for your chosen dominant color. It's amazingly useful, helping to pinpoint not only the most visually contrasting choices but to create flawless gradients from multiple colors. Choices that had to be eyeballed in the past are now spelled out right there on the wheel. 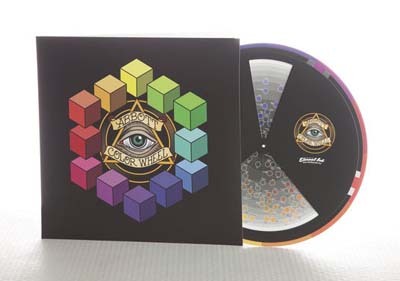 The Abbott Color Wheel is packaged in a gatefold dual vinyl record style cover. The inside flaps of the package feature a color theory primer to help you get familiar with the ACW. When not in use, the Abbott Color Wheel can be stored inside the package for protection- just like a vinyl record! Included in the kit is a 12" diameter removable wall decal of the Abbott Color Wheel which can be mounted near your work space to aid in color selection. This novel artist's tool might just help you to take your work to the next level... and we've got them now in the Tattoo Education online store! You can learn more about it in this short video. 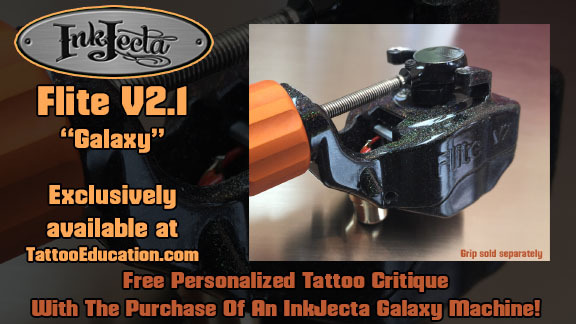 I also wanted to remind you of the InkJecta Galaxy tattoo machines that we've got in stock. Michele and I have been using this machine exclusively for the past year and a half. It's been delivering truly trouble-free tattooing with some of the most consistent healing results that we've experienced in our combined 42 years of tattooing. Drop by the online store to read more about this machine or to see the short video that I made about it. Last but not least, I'm posting a bunch of small and medium sized paintings at our eBay store for the next few weeks. Some auctions are slated to end very soon, with others that are just starting. This includes some of the paintings featured in my book Organica... drop by and take a look.